Potty training any dog is an exercise in frustration, requiring much patience, but chihuahua potty training is notoriously difficult. Chihuahuas are so tiny that they can easily slip away without you noticing, eliminate in a corner somewhere and get into bad habits before you even know what is happening. 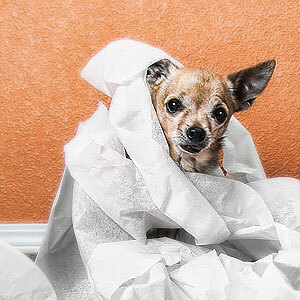 Follow these simple guidelines, however, and chihuahua potty training could be a breeze. The best way to potty train any dog is to use a crate. A crate is particularly suited to Chihuahuas because of their temperament and small size. Den security. Chihuahuas love to burrow in a den so you can use this fact to your advantage by making a crate into a den. Dogs generally do not like to eliminate in the same place that they sleep so will hold everything in until let out. Limit space. The area inside the crate should be just big enough for the puppy to turn around and stand up in. this is where chihuahua potty training gets tricky. These dogs are so tiny that they can easily squeeze into just about any space. If there is too much room in the crate the puppy will merely use one corner to sleep and the other to go potty. Happy place. Make the crate a warm, comfortable and inviting place for your chihuahua. He will happily sleep there while you go about other tasks. Frequent potty breaks. Remember that a puppy does not have much bladder control. Take your pooch out first thing in the morning, last thing at night, after a nap and about 20 to 30 minutes after every meal. Routine. If you establish a regular routine of feeding and potty breaks, chihuahua potty training will be much easier for you and your dog. Don’t feed any treats during this time, just stick to regular and frequent meals. This way you will be able to work out when your dog needs to go potty and be ready. Consistency. This is a very important part of potty training. Use the same words like ”Go potty” and always take your dog to the same spot while training. Praise lavishly when he performs so that he associates good things with eliminating in the designated spot. Be alert. As soon as your dog starts sniffing and circling, you will know he wants to eliminate, so scoop him up and take him outside immediately. If you are a bit late and he has already started to do his business, get him outside as quickly as possible and praise him for finishing it there. Accidents happen. Accidents are inevitable, especially with a puppy. Don’t make a fuss about it when it happens. Simply clean up and try to be more watchful in future. Remove as much of the odor as possible so that your pup doesn’t keep coming back to the same spot. With the help of a crate, a bit of time, attention and lots of patience, you can get through chihuahua potty training without tearing your hair out.